Pro Data Doctor powerful and real time website monitoring tool keeps close and constant watch over multiple website performance in real time. Software monitors your websites supporting all HTTP, HTTPS, SMTP, POP3 and FTP accounts. When your website is detected inaccessible or responds excessively slow, the monitoring tool will immediately send email alert to you about the non-availability of the particular website. Web site monitoring tool provides easy way for Webmaster and the Website owners who regularly checks the status of website and determines how well a website responds to browser request. Software provides variety of customized alert options including (Email, Alarm sound, Displays any program) when the given website is down or inaccessible due to any error including Host not Found, Connection Failed, Server Not Found, Low Bandwidth, Low Connectivity Network Status etc. 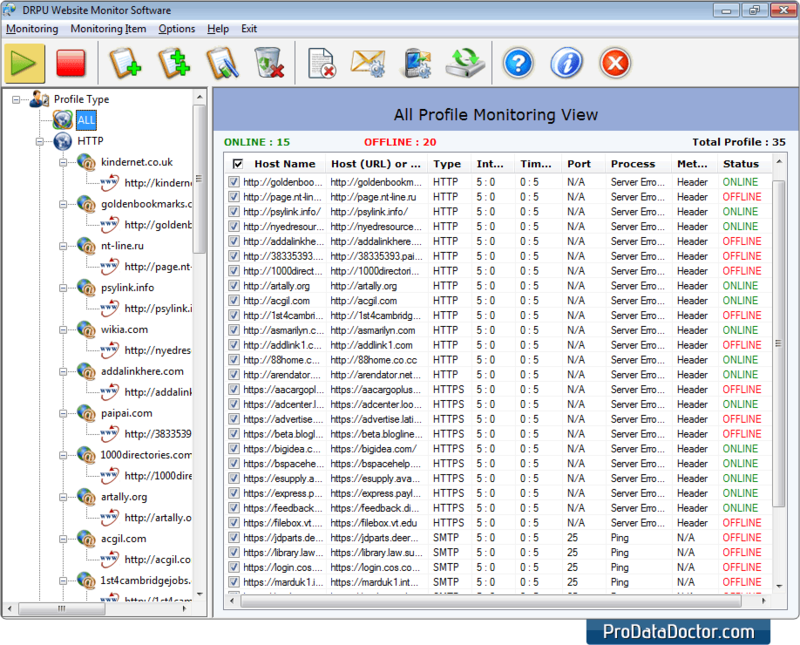 Website analyzer software unique features allow creating and monitoring number of profile at a time and facilitate to switch from main view to monitoring view for advance monitoring. Supports on Windows operating system including XP, Vista, server 2003, NT, ME, 2000, 98 and easily manages all your password protected websites ensuring that customers and visitors have access to your site at every single instant of time. The program is useful at Home and Organizational and best alternative to costly and time-consuming website monitoring services. Easily monitors website performance in real time. Supports major internet services protocols including HTTP, HTTPS, SMTP, POP3 and FTP accounts. Facilitate to send alert notification in case of non-availability or down websites. Provide option to switch from main view to monitoring view for advance website monitoring. Provide good alternate to manual and slow time-consuming website monitoring services. Easy to use and does not require any special skills to operate the software.